DISC Personality System is a powerful but still very simple took to understand people. It helps us to see our differences and certain personality limitations so we can unlock our human potential. DISC must be used in a positive and proactive way to enhance communication and relationships in the workplace and in other environments. 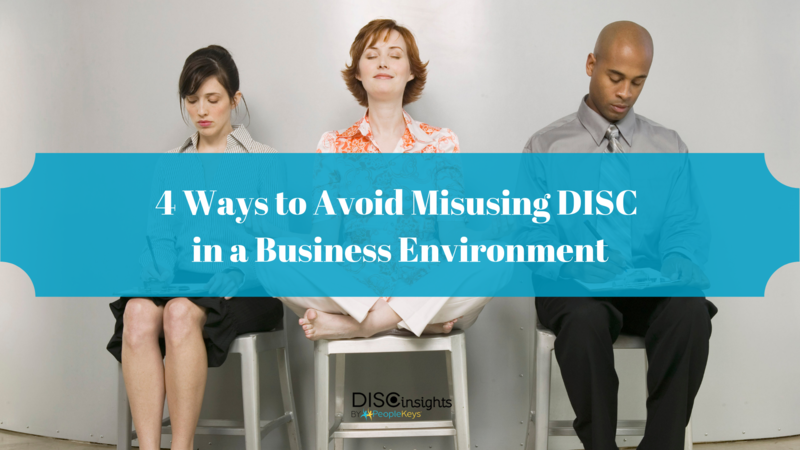 Here are some ways to avoid misusing DISC in your business. DISC styles change from environment to environment. Someone gives more energy to being a C at work, but that doesn't imply they are always a C style in all settings. DISC styles change from time to time. People can develop and display different aspects of their personality all throughout their lives. Someone who was a high S style may later prove to be more of a D over time or as a result of ongoing pressure-filled situations. Everyone is a combination of all 4 DISC behavioral dimensions blended together. People either give a lot of energy or a little energy to each dimension, but each dimension lies within all of us. Perhaps our DISC behavioral dimensions are the things that bind us all together and make us all human. The fact is, any style CAN do any job, though, they may not enjoy doing it. To determine who is a good behavioral fit for the job, it's perfectly legal to use DISC as part of the hiring process, but it shouldn't be the only deciding factor. DISC should be accompanied by other evaluation criteria. In hiring, combine DISC with an overall process which includes the candidate's education, past work experience, skills sets, location, salary needs, references, background checks and personal interviews. Other features of PeopleKey's DISC hiring process will allow you to benchmark the successful behavioral dimensions of your best performers so you can match your candidate and replicate your top performers. Another report feature can generate interview questions that will prompt your candidate to explain ways they were effective in areas where they fall outside of the behavioral benchmark. PeopleKeys trainers will help you understand that pairing teams of complementary styles can help to offset behavioral limitations. I cannot tell you how many times someone has said to me, "Well I am a C (or use any style you want), so that's just the way I am." The fact is DISC training can help you to understand your style and others to better adapt to different personality styles. Never use DISC as an excuse! A potential consulting client once said to me, "Show me what I need to do to get so and so to quit." It was not only wrong, but it's also terrible in fact. Marston's work, The Emotions of Normal People, gives you a clue DISC is to be used in a positive and proactive way to enhance communication and relationships. If you ever find someone using DISC as a demotivating tool, be aware, they probably are always looking at the wrong side of the situation. We believe in looking at the positive in people. One last bit of advice. While people tend to hire or want to work with people that are similar styles to their own, in relationships, it is true that opposites attract. Watch for an upcoming blog that talks about why opposites attract romantically and what to do once the feeling goes away. If you are currently using DISC to filter and hire, great! Now consider increasing your candidate insight by incorporating D4 into your current hiring process along with other candidate evaluation criteria, 4D will give you an additional 1,440 behavioral strengths points to help you make the right choice.